The legendary Norton Monoshock chassis, designed and built in the late ’80s by Jim Schmidt. With a total bike weight of less than 320lbs, it is still unrivaled–the best-handling chassis available for a Norton twin. 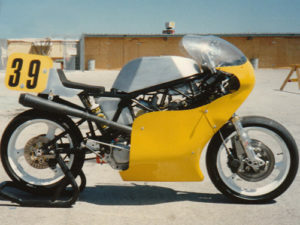 After several years of successful campaigns with Schmidt riding, it was sold to Ken Canaga, who punched it out to 920cc and added some trick wheels and brakes. Ken brought in legendary racer, designer, and all-around madman Dr. Rob Tuluie, who put it on the podium at a national GP Twins race, winning third place in a field of modern Ducatis at Willow Springs Raceway in September, 1990. 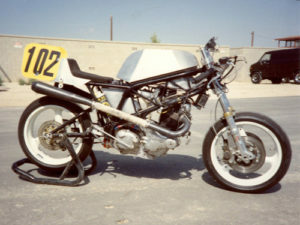 The plans include more than 40 photos, with dimensions and detailed autocad drawings of the chassis, tanks and swingarm. 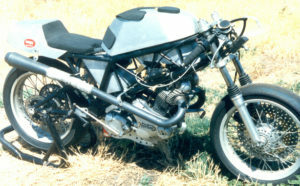 A more period-style Twin Shock configuration is included in the plans. Everything you need to make the fastest, most agile Norton for street or track. All data and images are contained on one CD. You will need Autocad 2000 or later to open. 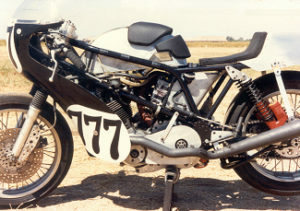 Note: Because of the way the motor is suspended, through-bolt 850cc, or bolt through Aluminum 750cc cylinders are necessary. The Below left – spoke wheel verson. 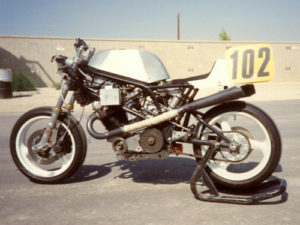 Below right – top view with JS custom 40mm guillotine carbs. 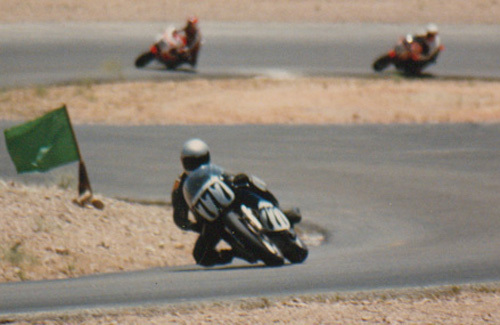 The Below left – racing against multi cylinders in the mid 1980s. 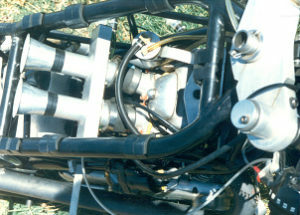 Below right – early twin shock version.